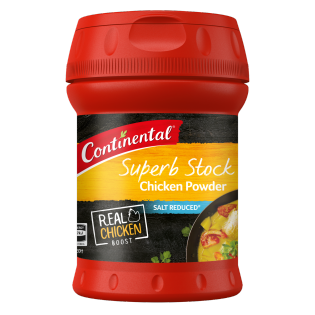 Add a flavour boost to your meals with Continental's Salt Reduced Chicken Stock Powder. Made with real chicken for a rich flavour with less salt. Learn more here. Salt, maltodextrin, sugar, corn starch, yeast extract, chicken (3.3%) [fat, powder (contains wheat, milk, soy and egg), natural flavour], free flow agent (341), onion powder, mineral salt (508), spices (celery seed, pepper, turmeric), herbs (marjoram, parsley). Contains naturally occurring glutamates. Allergens:Made on equipment that also processes products containing wheat, milk, soybean, peanut, egg, sesame, fish and crustacea. 1 teaspoon added to 250mL of hot water makes 1 cup of stock. For extra chicken flavour, add salt reduced chicken stock powder to soups, risottos, casseroles and gravy by either shaking or spooning the desired amount. Take your soups from starters to the main event with this scrumptious and hearty soup full of delicious chicken and sweet corn. This delicious, quick and easy chicken meatball & risoni recipe, was created by ex MasterChef Australia contestant Justine Schofield. It was made with Continental Superb Stock – which has 40% less salt than the market leading liquid stock (excluding salt reduced variants) for her 2018 show Everyday Gourmet. Create this delicious chicken pesto pasta for two. So simple it's the perfect dish for a mid-week meal. Continental's secret roast chicken tips helps bring out that authentically flavoursome chicken taste. Discover how to achieve perfect results every time. Learn how to make deliciously tasty homemade soups with Continental’s soup cooking guide. Don’t waste what’s left of your herbs – here’s some tips how to make fresh herbs go further.